Here’s a visual guide to fostering a growth mindset in the classroom. I linked a video to Angela Duckworth’s excellent TedTalk on the subject at the bottom of this post. Click here for Angela Duckworth’s tedTalk on why we need to encourage growth mindset with our students. I hope you found this infographic helpful. If you need more information on how to foster grit and a a growth mindset in your classroom, feel free to reach out in the comments. Categories: College, Education, higher ed, Professional Development, Teaching | Tags: angela duckworth, backtoschool, brain, classroom, college, College Life, collegeready, Colleges and Universities, education, grit, growth mindset, Infographic, motivation, neuroscience, students, success, teaching, tedtalk, video | Permalink. Yes, It Pays to Go to College. Here’s Why. Does it pay to go to college? Yes! We hear that question a lot in the news. And the simple answer is, yes…it does. 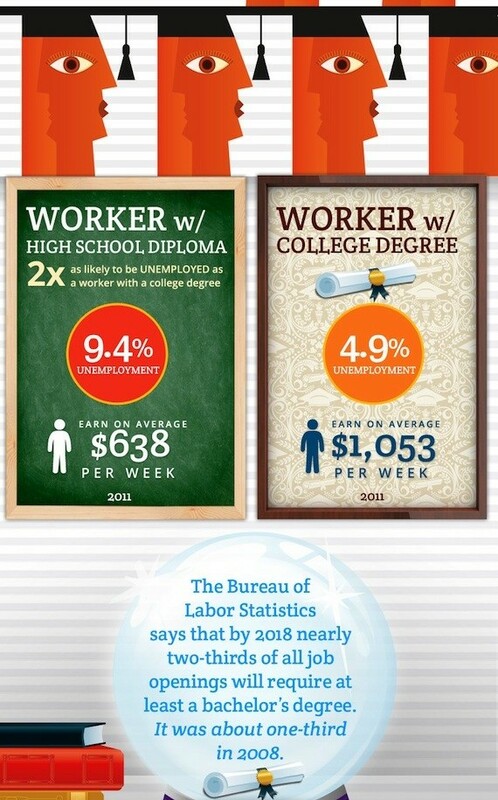 These statistics from the U.S. Bureau of Labor Statistics reflect the difference in weekly salary and in the unemployment rate between a worker with a high school diploma and a college degree. So, the answer is yes, but proceed with awareness. See my earlier post regarding the ROI–Return on Investment-of a college degree. The territory needs to be navigated with not only enthusiasm for a certain school or university, but with awareness and information. This awareness should include a strategy to get to the finish line with a diploma in hand and without the burden of too much debt. To do this, make sure to carefully consider which college you attend, for how long, and what if any student loan debt you will have upon graduation. Visit your on-campus advisors and counselors early and often and make sure to have the information you need to be informed. Millennials are the workplace of the future. Those with degrees will not only be more employable after graduation, they will make higher salaries and be in demand. Categories: College, Education, Uncategorized | Tags: Business, college, college ready, education, education infographic, employment, happy teacher, Infographic, jobs, millennials, salary, students | Permalink. Leadership. Digital Literacy. Communication. Emotional Intelligence. Entrepreneurship. Global Citizenship. Problem Solving. Team Working. Notice the strong reliance on the social-emotional aspects of interpersonal communication, along with the need to lead and be able to work in a collaborative environment. Students often balk at group work, but this is what all future employers see as essential. 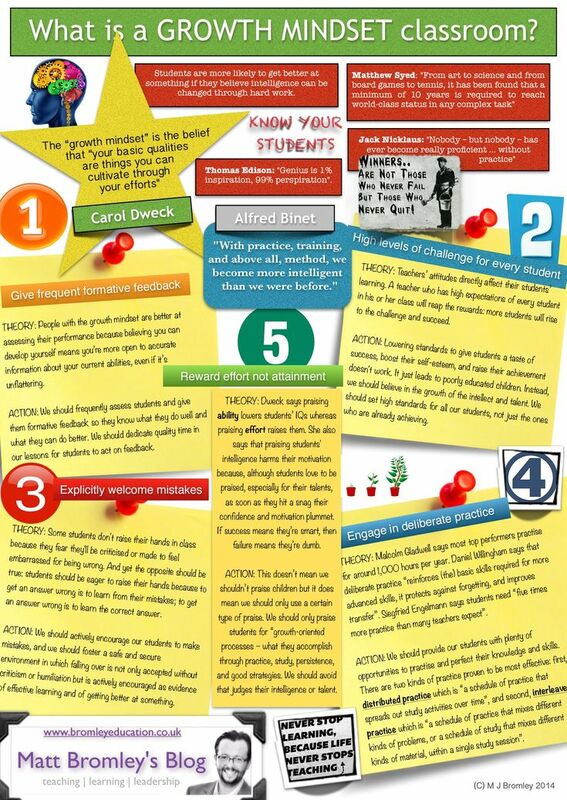 I found this post via Edudemic. You can read their entire post here. The information and graphic came from the original report called “The Learning Curve,” produced by Pearson. You can read it here. Categories: College, Education, News, Teaching, Uncategorized | Tags: 21st century skills, classroom, digital literacy, ed tech, education, education infographic, entrepreneurs, happy teacher, Infographic, Social media, students, teachers, teaching, tech, web 2.0 | Permalink. AKA, what kind of smart are you? You can also encourage students to take any number of free online surveys that will help them to determine which type of learner they are. Here is one I often use with my students, from the folks at LiteracyNet. There are 56 questions,(don’t worry, it goes fast, just a bubble to select), and after answering all of them, the student will get their top three strengths, as well as how the other 5 intelligences rank. This information is extremely helpful to students, as they can devise study strategies around their individual learning styles. Categories: College, Education, Professional Development, Social Media, Teaching, Uncategorized | Tags: classroom, education, howard gardner, Infographic, learning, learning styles, multiple intelligences, students, teaching, twitter, visual learner | Permalink. As we get to the end of the semester and school year, we are expecting our students to demonstrate higher order thinking skills, or Critical Thinking. 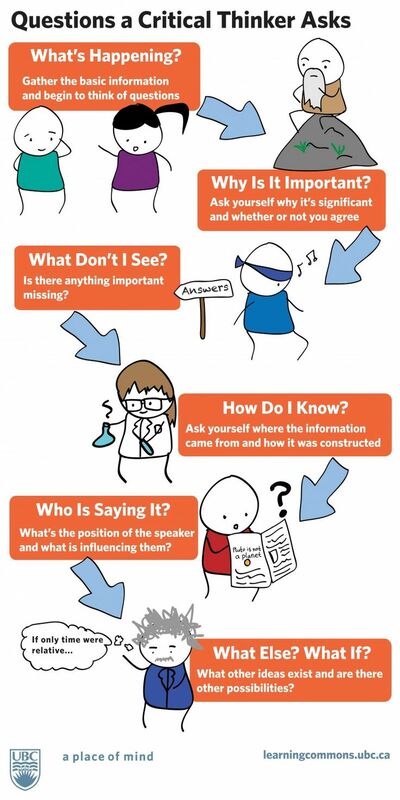 I like this infographic from Learning Commons at the University of British Columbia. Thanks to its simple flow chart style, students can use it to clearly reflect on their own thinking. Students need to constantly question their own process, and those of others. They need to ask questions about the text they read, test possibilities, and allow for new discoveries. Higher order thinking skills (HOTS) push our students beyond simple responses and elevate them to scholars and critics in their own right. Part of what’s vital in education is for students to learn to trust their own voice, while still questioning their thinking. What strategies do you use in your classroom to encourage critical thinking? Categories: College, Education, Professional Development, Teaching, Uncategorized, Writing | Tags: classroom, college, college ready, critical thinking, education, education infographics, einstein, English, happy teacher, higher ed, Infographic, inquiry learning, scholar, student success, students, teaching, writing, zen | Permalink. With 74% of teachers saying educational technology motivates students, and two-thirds of teachers surveyed saying they want MORE classroom technology, it is clear that teachers are both embracing and utilizing digital resources in innovative and meaningful ways to facilitate student success. Engaged students are successful students! How are you using digital resources in the classroom? Have you started a blog? Using iPads or e-readers? What innovative ideas have you come up with to help your students? I’d love to hear from you! Categories: Uncategorized | Tags: classroom, college, digital learning, dld, edtech, education, Infographic, ipad, pbs, teaching, technology | Permalink. 85% of college-educated professionals say creative thinking is critical for problem solving in their career. The study interviewed 1000 college-educated professionals who were employed full-time, 25+ years of age. See source “Creativity and Education: Why it Matters,” by Adobe. Categories: College, Education, Professional Development, Social Media, Teaching, Uncategorized | Tags: adobe, careers, classroom, college ready, connection, creativity, education, happy teacher, Infographic, student success, teaching | Permalink.